This morning, Zillow, the company behind the love it or hate it Zestimate, released a new study that analyzed the impact credit scores have on mortgage rates and corresponding payments. The company used data from 13 million loan quotes and 225,000+ purchase loan requests on the Zillow Mortgage Marketplace. What they found was that borrowers with FICO scores south of 620 shopping for Zillow mortgage rates were unlikely to receive even one mortgage quote, in spite of being able to provide a sizable down payment between 15 and 25%. At the same time, Zillow noted that the best mortgage rates are now reserved for borrowers with 740+ FICO scores, a departure from the old rule of 720 and higher. Zillow said borrowers with scores above that key level were offered an average rate of 4.42% (APR) for a conventional 30-year fixed mortgage. That compares to 5.09% APR for a score between 620 and 639. So clearly credit score matters, a lot. As you can see, the lower the FICO score, the higher the mortgage interest rate, a concept most people already grasp. The chart also indicates what percentage of the population has a certain FICO score. Note that 28.4% of Americans have FICO scores below 620, the traditional subprime cutoff, meaning many are ineligible for most home loan financing based on credit score alone. Yes, there are ways to get a mortgage with a low credit score, but as you can see from the chart above, it will cost you. It will also make it more difficult to find financing, seeing that many lenders require credit scores above 620. 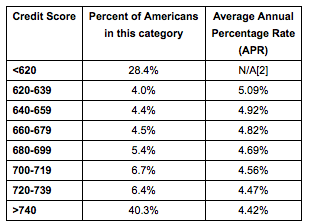 Fortunately, the majority of Americans out there have FICO scores in the highest bracket, with 40.3% in the 740+ category. For these individuals, credit likely won’t be an issue when trying to obtain a home loan. However, credit score alone isn’t everything. Mortgage underwriters look at what’s behind your score as well, and if they find anything questionable, your application could be in jeopardy. Check out this screenshot from a lender rate sheet. It details the pricing adjustment for credit score across different LTV ratios. The higher the LTV, the larger the credit score hit. Similarly, the lower the credit score, the larger the hit. Heck, even with a halfway decent credit score of say 659 with more than 20% down, you’d be looking at a three point hit for FICO score alone. That could be enough to push your mortgage rate from 4.25% to 4.875%, just to throw out an example. And a rate that much higher will clearly impact your monthly mortgage payment, along with the total amount of interest you pay throughout the life of the loan. It will also add to the layered risk of your loan application, which will make it much easier for an underwriter to flat out deny you. So yes, Zillow is correct in saying credit score is the most important factor for rates and payments, all else being equal. Just understand that there are other pricing adjustments that can significantly impact your rate, such as LTV and property type. But credit score is of the few things we can all fully control, as hard as it might be sometimes. Zillow also smartly recommends that you check your credit report at least six months before applying for a home loan. Again, great advice. If there any mistakes or surprises you’re unaware of, tackling them could take a lot longer than you think. So knowing where you stand months in advance is paramount.